full 25-year replacement warranty and acceptance by the company's insurance underwriter. Tiffany & Co., known for its fine silverware and jewelry, also sparkles when it comes to alternative energy, with the recent installation of a 1.3 megawatt solar power system on two of its distribution centers. Mention the name Tiffany & Co. to someone and chances are one of the world's premiere jewelry companies quickly comes to mind, followed shortly by high-quality products and a trusted purveyor of wares. Since the New York City company was founded in 1837 by Charles Lewis Tiffany and John B. Young as a stationer and fancy goods emporium, it has created a 170-year legacy of style. Central to the company's growth has been corporate environmental and social responsibility. In fact, Tiffany & Co. leaders consider sustainability their most precious quality. So it is only fitting that Tiffany & Co. followed that same philosophy when it decided to have SunPower Corp. of San Jose, California, install a 1.3-megawatt solar-power system on two of its New Jersey distribution facilities. As part of the project, lights in the two buildings were upgraded to more energy efficient fixtures. Together, the improvements are expected to net the company nearly $500,000 in annual energy savings. "Integrating solar power into our energy portfolio is one step in our efforts to help impact the climate change challenge we are confronting," says Tiffany chairman and chief executive officer Michael Kowalski. "It is part of our broader goal of sustainable style, bringing our customers enduring designs while upholding our commitment to help protect the beauty of the natural world and to responsibly use the natural resources it provides." The planning phase began within Tiffany & Co. about a year before internal approval was granted, and it contracted with SunPower, formerly known as PowerLight, says Larry Palfini, Tiffany vice-president of global construction and property management services. "After much research and comparison, our decision to go with PowerLight and its PowerGuard interlocking system was influenced by the following factors: its lightweight design, high energy output efficiency rating, a full 25-year replacement warranty, and above all, acceptance by Factory Mutual, our insurance underwriter," Palfini says. The project involves Tiffany's 266,000-square-foot customer fulfillment center in Whippany, New Jersey, and its 374,000-square-foot retail service center in nearby Parsippany, N.J. In early 2005, SunPower conducted an energy audit of the two buildings, which is standard procedure for all projects, says Tom Leyden, managing director of SunPower's East Coast operations in Trenton, N.J.
"We look for other energy efficiency measures we can make," he says. "We like to combine onsite efficiency with solar." In the case of the two buildings, it meant changing about 400 metal halide fixtures over to 1,500 high-output fluorescent fixtures with electronic ballasts. "That cuts the cost of lighting by 50 percent, and lighting in these buildings is a pretty high cost," Leyden says. "In fact, the energy efficiency savings is almost the same as the output of the solar." Rowe Electric Inc. of Ringoes, N.J., completed the work during off hours, so none of the operations at either facility were disrupted, Palfini says. Leyden says SunPower recommended PowerGuard solar tiles because they have a lightweight, building-integrated assembly that can be easily installed over existing roof membranes. "There was no modification whatsoever," Leyden says. "This product goes together like a puzzle, so we can work around obstacles on the roof as long as we have room on the roof. And we can pretty much go on any roof." The interlocking tongue-and-groove assembly allows the system to resist wind uplift without roof penetrations. In addition to generating electricity, the panels help insulate the roof, reducing heating and cooling costs. They also shield the membrane from ultraviolet rays and thermodegredation, prolonging the roof's life. The solar modules within the panels are manufactured by Sharp and SunPower and have an output warranty of 25 years, Leyden says. The design life is at least 30 years. The panels are also virtually maintenance free, he says. "In the case of the East Coast, there's enough rain that will wash off any soilant you get on the modules," Leyden says. The Whippany facility system involved 61,000 square feet of PV surface area-3,262 solar tiles-and has a peak capacity of 678 kilowatts. The Parsippany facility involved 66,000 square feet of PV surface area-3,150 solar tiles-and has a peak capacity of 655 kW. 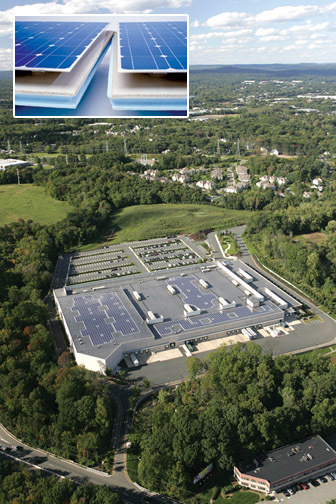 Tiffany's Whippany facility system involved 61,000 square feet of PV surface solar tiles-and has a peak capacity of 678 kW. The Parsippany facility involved 66,000 square feet of PV surface area-3,150 solar tiles-and has a peak capacity of 655 kW. The panels convert sunlight into direct current electricity, which runs through Xantrex PV Series inverters to convert it to alternating current. The AC then flows into the building's service panel. The systems together are designed to generate about 30 percent of the facilities' electrical load at peak demand. Jersey Central Power & Light Co. of Morristown serves the two facilities, and Palfini says Tiffany & Co. enjoys energy savings by using about 30 percent less commercially produced power. Both Tiffany solar systems began generating electricity during the summer of 2006, but weren't officially dedicated until this past April. Palfini says Tiffany & Co. officials have been extremely satisfied with the solar systems' performance, "which are exceeding our expectations and returning higher than anticipated savings." New Jersey's Clean Energy Program played a significant role in Tiffany & Co. deciding to move forward with the project, Palfini says. The Customer Onsite Renewable Energy program offers rebates to projects up to 700,000 watts in size. That's why the solar system on each facility was treated separately, Leyden says. Commercial projects ranging from 500,001 to 700,000 watts receive rebates of $2 per watt, according to the September 1, 2006 rebate schedule. During 2006, New Jersey's Clean Energy Program provided more than $20.7 million in rebates for 1,001 solar projects. The rebates are the result of the Electric Discount and Energy Competition Act that the New Jersey Legislature passed in 1999. In addition to deregulating the industry, the bill established funding for the Clean Energy Program. Utilities are assessed a "social benefits charge" at the point of use for electricity and natural gas. The New Jersey Board of Public Utilities in Newark requires that no less than 50 percent of the fees go toward energy efficiency programs and 25 percent go toward renewable energy projects. Although the roofs of both of Tiffany's buildings have space for additional PV panels, Leyden and Palfini say the Clean Energy Program's rebate schedule was the limiting factor in the projects' size. "We're currently evaluating whether to increase the capacity of our existing solar system," Palfini says. "The limiting factors are that the maximum renewable energy rebates have already been granted for our installations, and the cost of increasing the existing capacity of these systems may be cost-prohibitive." "Now if something changes in the future and there's an additional strong incentive to invest more, they can do that-there's extra roof space," Leyden says. In addition, Tiffany & Co. is able to sell solar renewable energy credits (SRECs) based on the amount of energy the systems generate. The SRECs are part of aggressive renewable energy portfolio standards established by the New Jersey Board of Public Utilities. By 2021, 22.5 percent of the electricity delivered to retail customers in the state must come from renewable sources. Of the renewable energy, 2.12 percent must be specifically from solar. Energy companies have three options: they can build their own renewable generation facilities; they can pay a 30-cent-per-kilowatt penalty; or they can buy Renewable Energy Credits (RECs). Nearly all choose to buy RECs. Unlike carbon credits, which are traded on the Chicago Climate Exchange, SRECs are traded between willing buyers and sellers, Leyden says. 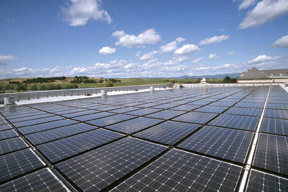 SunPower works with its customers to aggregate the SRECs and negotiate prices and terms for them. By combining the SRECs into larger lots, Leyden says SunPower is able to obtain better prices. Energy suppliers also prefer the system, since they are working with fewer, but larger, lots. The New Jersey Clean Energy Program doesn't track individual trades. But it does keep track of the total number of SRECs issued and traded to ensure they accurately represent the amount of renewable energy that is generated. During May of this year, 3,375 SRECs were traded, with prices ranging from $150 per MWh to $265 per MWh, according to the Clean Energy Program. From June 1, 2006, through May 31, 17,705 SRECs had been traded with a cumulative weighted average price of $217.96 per MWh. For the reporting year, which ended May 31, a total of 31,635 SRECs had been issued. Leyden credits New Jersey's aggressive renewable energy portfolio and attractive rebates for the larger number of solar systems that have been installed in the state. He says three factors contribute to a strong solar market: "How much sun is available, the cost of electricity that we are displacing and incentives. "In Hawaii, for example, there's lots of sun, very expensive electricity and modest state tax credits, but it's good enough to create a market there. "In New Jersey, the sunlight availability is less than Southern California, but the cost of electricity is high and the incentive is strong." The states of Maryland, California, Pennsylvania, Colorado, Nevada, Texas and North Carolina are also in various stages of developing renewable energy standards and incentive programs. As other states follow, Leyden says the demand for solar will accelerate. "The market is limited by just what incentives are available in just these few states," he says.